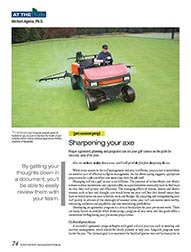 While every season is different, preparation is always an essential part of effective turfgrass management. 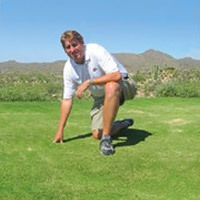 The presence of biotic and abiotic stresses is often inconsistent and unpredictable, so superintendents have to find ways to treat their turf effectively. By preparing and strengthening turf quality in advance of seasonal stress, turf can recover quicker, enhancing aesthetics and playability. Offer comprehensive, season-long management of pressures affecting your region and turf type, like bentgrass greens or poa annua fairways. 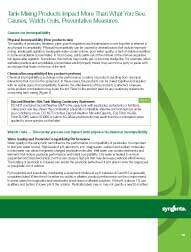 Our interactive agronomic programs tool gives you quick access to web-based programs with links to product labels, product volume calculators, related programs and more. 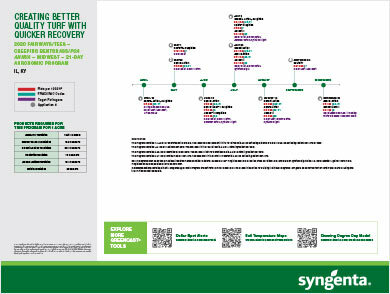 To find a tailored program for your turf type and region, simply select your program needs below. For an agronomic Program Poster, please contact your local territory manager. 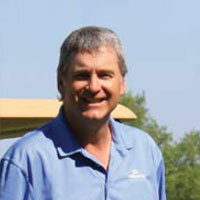 Superintendent, Merit Club, Libertyville, IL See how John Nelson of the Merit Club has proven his technique through the course's enhanced playability and stunning aesthetics. Santee, SC "At the convergence of productivity, quality and implementing new technologies is the spray program. 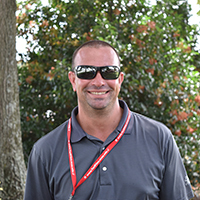 Scarborough forged a relationship with Syngenta territory manager Larry Feller more than 20 years ago, and the pair works together to create a preventative approach that allows Scarborough to cover 36 holes without straining the maintenance budget." 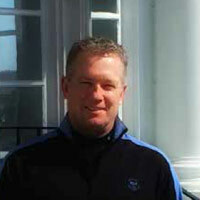 Ocean View, DE "[Mike Agnew & Doug Rider] have both been great resources to me being newer to the area than some of the other superintendents around here." Mainville, OH "We try to keep it simple and don’t try to get too convoluted. We rotate Secure and Daconil Action. 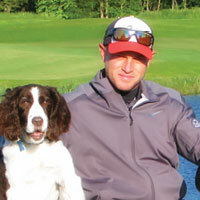 We will go with Secure a couple of times in the spring and then switch over to Daconil Action when the dollar spot pressure is high, and then rotate between Secure and Daconil Action and sometimes rotate those two for dollar spot and brown patch." Austin, TX "The place has really started to shine. 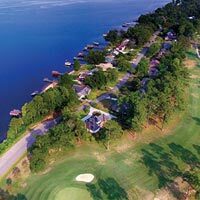 Membership is ecstatic, ownership is ecstatic, the golf teams, are extremely happy to have a place to practice regularly in similar conditions to what they would see on a day-to-day basis at a tournament venue." Scottsdale, AZ The chemistries available in today’s market make it financially beneficial to emphasize preventative approaches vs. curative methods, Emerson says. Disease pressure is lower in the Southwest than other regions, but Daconil Action and Heritage Action are part of the spray program. Libertyville, IL "The program got me back to where I should be, rotating products more efficiently… It got me back into a better rotation and a more timely application of certain products to head off disease pressure before it came." Penhook, VA "The dollars are about the same...we might have saved 10 percent, but improvement in the quality of the fairways and the rough went up 100 percent by using better products." 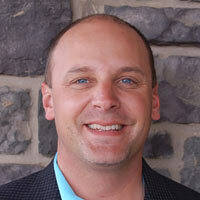 Sewickley, PA Following the recommendations of Syngenta technical manager Dr. Mike Agnew, Dickson decided eight years ago to perform applications on two-week rotations. “We have been spotless ever since,” Dickson says. Fuquay-Varina, NC "We’ve been using an agronomic program from Syngenta for the past three years on our bentgrass greens and it’s been going great. A lot of research is put into these programs so it’s a no-brainer for us to take advantage of that. 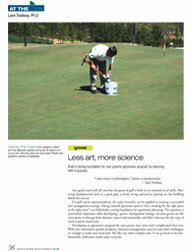 It keeps our greens in better condition year-round and we haven’t seen any disease since we started using the program. The application intervals have helped us get our timing right and we don’t have any breakdowns for a specific disease. It helps me sleep better at night knowing we have the major diseases covered. Additionally, the program helps us with our purchasing because we already know the amounts we’ll need for the year and we can early order everything. 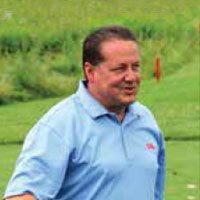 It helps keep our budget in line so we aren’t overspending, which makes our boss happy and keeps our greens healthy. At the end of the day, we have a better product to give our golfers and a happy golfer is the greatest return on investment." 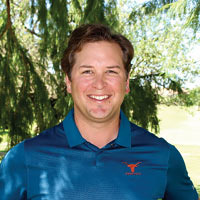 Syngenta technical manager Mike Agnew, Ph.D., presents how to build a successful agronomic program and provides considerations for abiotic and biotic stress management. Watch the turf enhancements unfold in real-life conditions. 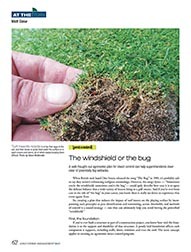 See how Velista fungicide provides reliable control against anthracnose. The Syngenta program featuring Daconil Action, Velista, Appear, Primo Maxx and Heritage Action demonstrated high-quality turf that recovers from aeration more quickly. Appear fungicide features two components that work together to improve summer stress tolerance, turf quality and control of both Pythium and anthracnose.